Most of us have heard of how we need to drink eight glasses of water a day to keep our bodies hydrated and the cells clean from chemical debris. But what many of us don't know is that; chlorinated and fluoridated drinking water is not only hard to swallow and tastes bad, it will not hydrate your cells properly and it’s not capable of cleaning your body from toxins. City water is usually extracted from rivers, or lakes nearby; sediments screened and removed while bacteria are eliminated by including chemical additives to the water. But these waters already contain many forms of chemicals from pollution via sewage, industries, pesticides, insecticides, pharmaceutical dumping, Benzene, heavy metals, and arsenic amongst other unhealthy toxins. These substances are not removed, instead more chemicals like chlorine is added to kill bacteria and in most cases fluoride are also added which they claim helps to keep the population's teeth healthy! Not in the least concerned of the long term effect it will have on your health. Our body is trying to clean itself from impurities of toxins, heavy metals, and poisons. So how can chemically packed water help cleanse your cells from the same toxins your body is trying to get rid of! It is like saying let us clean our house with the same dirt we are trying to remove! It just doesn't make sense. Most people assume that just because the city has declared the water safe to drink, it must be good for you. That is sadly not the case. The body is efficient in filtering out toxins, but needs to flush it out. Water molecule cluster size changes with added chemicals. It is important to note and understand that the water molecule cluster's size becomes bigger as it mingles with other chemical molecules and bonds with them. 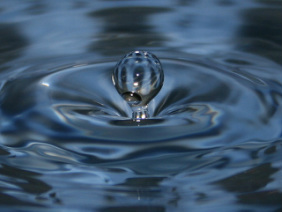 Your body cells will only allow small water molecule clusters to enter its walls to hydrate and cleanse the toxins out. Therefore The more chemicals your drinking water contains the less water clusters can enter the cells leaving them dehydrated and full of toxins. (see second image). If this dehydration continues for an extended period of time, the life span of these cells will be shortened and signs of aging will become apparent in the body sooner than later. Healthy body cells require healthy water. 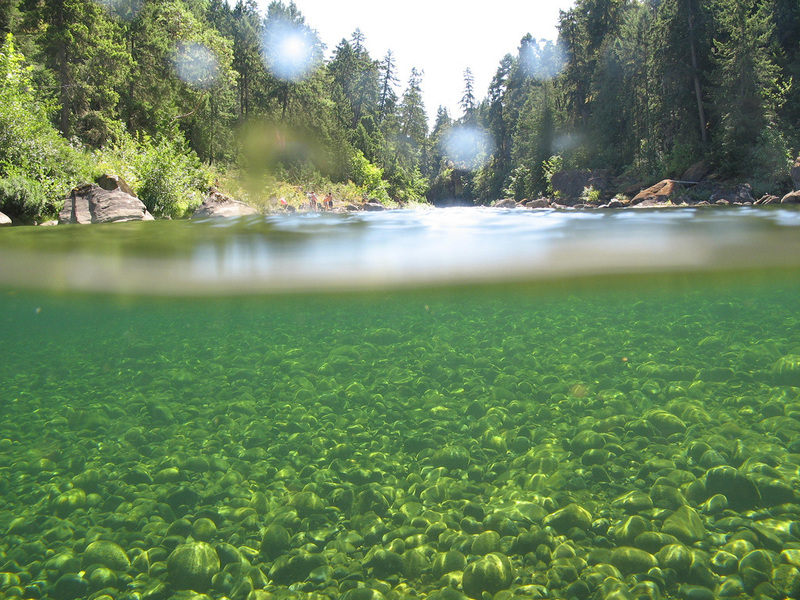 As you can see in the first image the clusters of the water are small without any chemicals added. 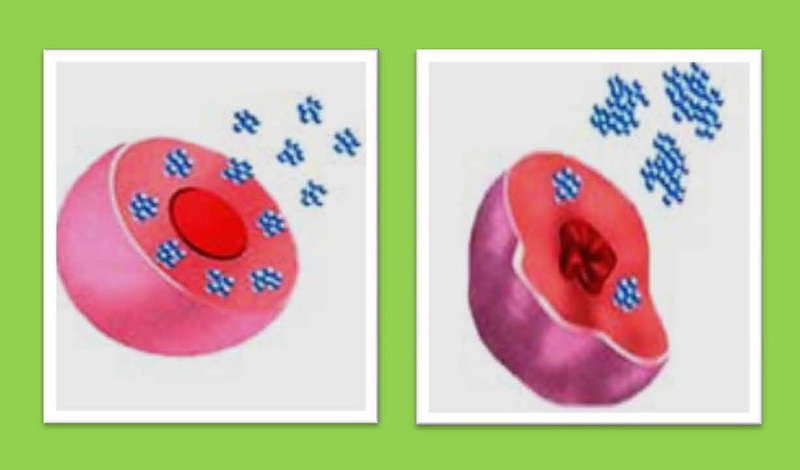 Therefore the cells can absorb more water clusters to keep themselves hydrated, clean and healthy. If you can drink consecutively three glasses of water without feeling nauseous or full, it is an indication that your drinking water is good. Many people are buying bottled water which supposedly has less chlorine in it, but if you look closely fluoride has been added to most bottled water in North America. Bottled water imported from Europe doesn’t usually contain fluoride because Europeans resisted this chemical additive in their drinking water right from the start; they knew the effects it will have on their health. An increasing number of cities now in North America are resisting this imposed regulation and removing fluoride from their drinking water. Also anything stored in plastic is unhealthy due to the seepage of plastic toxins. Even though distilled water is free from chemicals it is not balanced. The absence of minerals in distilled water will force the body to borrow stored minerals out of the organs, bones and other parts of the body in order to balance itself and Neutralize the acid in the body. In the long run this will have a negative impact on the overall health of the body. The PH is a scale that measures how acidic or alkaline a substance is. The scale ranges from 1 to 14 with (1 being very acidic), (7 neutral) and (14 very alkaline). Pure water is neutral with a PH level of 7. But when chemicals are mixed with water, the mixture can become either acidic or basic. Not too many people pay attention to the PH levels of the drinking water; alkaline water of PH level 7.35 is ideal for a healthy body which is the same as the PH level the body tries hard to maintain. Minerals in pure water can elevate the level of its alkalinity from PH of 7 to anywhere close to 8. Staying around the 7.5 mark is where you want to be. too much of alkalinity or acidity is bad. High acid levels in the body actually strips away the negative charge from the red blood cells, making them clump together which restrict the circulation and weakens them to the point where they begin to die. In conclusion to the above information, filtration systems for use in the city is your best option. But not all filtration systems are equal or capable of filtering all chemicals out of the water. You need to do your research on what each filtration system can or can't do. But I know that a reverse Osmosis system which fits under your kitchen sink can eliminate the majority of chemicals if not all. But these systems are not cheap and do eliminate all minerals as well. However there is a workaround; you can purchase a product of mineral rocks, especially designed to re-mineralize the drinking water by simply letting it sit at the bottom of your container. There is also a standalone filtration systems called the Berkey which I use personally. These filters have very favourable reviews and can filter out all health hazard substances including waters from rivers and streams. What is so great about this system is the fact that you can take it with you anywhere, and comes in many different sizes according to your needs! You can also order with it a box of mineral rocks to keep your drinking water at a good PH level. If you are interested in the Berkey use the following link "Conscious Water" to look at all of the options available. These are just but a few suggestions only to help you with your search and give you an idea where to start. We hope that one day all cities will adopt a better way of providing healthy, chemical free, clean water.